Photo by South Africa The Good News. And so, we come again to another season of “peace and goodwill to all”—a time of exercising kindness, generosity, and care. That time of year that fills us with warm, fuzzy feelings as we drop a couple of $5.00 toys in the donation box for a local toy drive. That time of year when cleaning out our closets and donating that sweater or pair of pants that has been too small for three years gives us the sense we are making a difference. That time of year when we weep at the sight of stories about the nine-year-old gathering used coats for the homeless, or the family who is spending yet another holiday season in shelter because the parents in the family are unable to find work. And through all of this we quietly pride ourselves in the level of compassion we feel. True compassion is more than flinging a coin to a beggar; it comes to see that an edifice which produces beggars needs restructuring. –Martin Luther King Jr. But for most of our society that is where compassion ends. Rather than seeking out opportunities to act on and with our compassion, we return to our well-warmed homes decorated with lights and ornaments and the aroma of holiday goodies baking in the kitchen. We might ponder for a moment or two on the misfortune of others, but we are not moved to step away from our comforts to engage with the messy world of homelessness, poverty, disease, joblessness, or utter loneliness and despair. We quickly convince ourselves that the problems are too big and complicated for us to make a difference. Being compassionate and living compassionately is hard, dirty work. Being compassionate demands we be accepting of others and their circumstances. Living compassionately means walking alongside those in pain, broken, and rejected by society. Being compassionate requires making no judgments of another’s person or situation. Living compassionately is to engage with the lost, the disturbed, and the diseased. One can be compassionate, and yet not live out that compassion. One can live out compassion without being compassionate. Being compassionate and living compassionately must go hand-in-hand for such a union to give dignity and hope to the other. Compassion is a reality check. It is a reminder that we are all equal, that we are no better or worse than the drug addicted veteran, or the aging woman pushing around an old grocery cart filled with all her worldly possessions. Compassion reminds us that we are not helping someone less fortunate than ourselves, but rather a fellow human being who is experiencing struggle and disdain for whatever reason. Because compassion calls us back into the bleak reality of our world when we resist that call to care and to engage. A common assumption among many people in our culture is that our society lacks discipline, obedience, and accountability. I have never accepted that logic. I believe much of the unlawfulness, and dissonance in our country is rooted in our lack of compassion for one another. The growing income gap between the wealthy and the middle class is an example of the diminished capacity for demonstrating compassion. As the world honors Nelson Mandela at his passing, over and over again those who knew him speak of his ability to forgive. 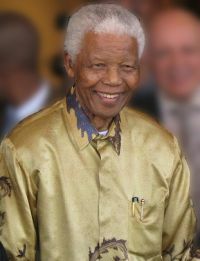 The indelible mark of his ability to forgive his captors and those who worked to destroy him served as the cornerstone for freeing South Africa from apartheid. Mandela’s desire and intention to show compassion to his persecutors and critics empowered the tribes and factions among Black Africans to come together and restore a nation that today has the strongest and stable economy and political system in Africa. Forgiveness is the foundation of compassion. Without forgiveness, there is no compassion, only empty acts that dehumanize the other. For compassion to take root, we must look past what the person has done or not done, we must not concern ourselves with questions of deserving help or their right to care. For compassion to re-establish itself in homes, neighborhoods, communities, and society we must learn to be forgiving—with no strings attached and no conditions to be met. Only in this environment can compassion flourish. In this season of hope and peace, what our neighborhoods, villages, and society need most is for of us to identify with the suffering. What is needed most are people who have the courage to not just feel compassion, but to act courageously with compassion! Williamson, M. (2013). Retrieved from Voices and Verses, Sojourners on Monday, December 9, 2013. All other quotes retrieved from http://www.goodreads.com/quotes/tag/compassion on Wednesday, December 11, 2013.